Are you thinking of adding a special touch to your kitchen? Without doing a full remodel you can add some special finishes and change the look. If your counter top material is good you can just add a new backsplash. Let’s say you purchased a home and you don’t like the backsplash but you can tolerate the countertop, especially if it is granite or quartz. 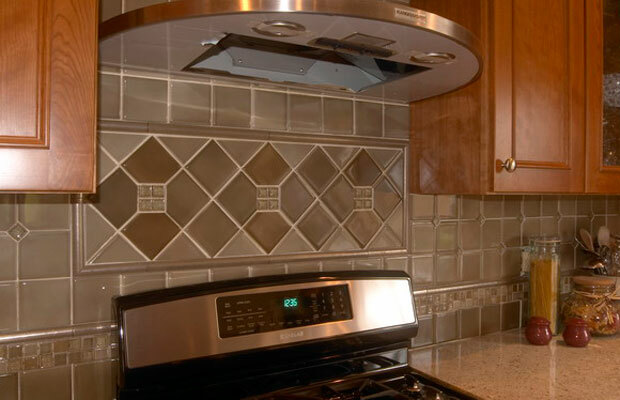 Using a new tile can add focus to your kitchen. Newer kitchens will extend the splash all the way up to the upper cabinets, that’s what we call a “full height splash”. Choosing the pattern and specific tile can be tricky but there are a lot of choices out there. A classic look which is still popular is subway tile. It comes in ceramic and glass and in several sizes like 3”x6” a standard but also large format sizes too. Tile can be horizontal or vertical, matte or glazed, some have a crackle finish, and some have beveled edges. There are several good tile companies to look at your choices. Here in Seattle I would go to Dal Tile, OTM, United Tile, Statements and Contract Furnishings Mart. You may need to ask your tile installer to give you an idea of how much will need, don’t worry he can purchase it for you if you need. He can also remove the old tile on the wall. To add a special detail I like to make a statement over the cooktop with a framed out inset of a tile detail. Don’t forget to choose the grout! It can be an exact match or a contrasting color like gray. The contrasting color will make each tile stand out and create its own design. If you want to add deco’s then choose one that complements your tile. Look for ideas on how to install their pattern, go to the tile company’s websites or check HOUZZ for ideas. Pay special attention to how the tile blends in with your countertop, cabinet color and flooring. They should all complement each other. It doesn’t have to be “matchy” but the undertones of each item colors should be the same- otherwise you could end up with a pink toned tile with an orange toned cabinet! Don’t forget your paint color, which is the easiest thing to change. So remember for tile choices think: Size, Finish, Color, Pattern, Grout. It sometimes pays to get professional help to just pick out the details.